This is my travelog for our trip to Sicily in early February 2014. We put this trip together ourselves — no travel agents, tour guides, etc. It’s a pretty straightforward summary, and I hope it might be helpful to others who are planning a trip! Took a Delta flight from JFK to Milan, then took an EasyJet flight to Palermo. R. had to check his suitcase on the EasyJet flight. They charge you for everything, including water and even printing a boarding pass, if you don’t already have one. It was a long, exhausting day of traveling. Took the train from the airport to the city center, and our hotel (the Ambasciatori Hotel) was a few blocks away and very easy to find. We had lunch in a beautiful restaurant, where we shared a pasta dish with little shrimp (a bit too fishy for me) and a chickpea stew. R. wanted to keep exploring, but I was too exhausted – usually he’s the one who needs to take a nap! Our hotel was nice, with extremely soundproof (and lightproof) windows and shutters. Got our first cannolo in the morning, which was cheesier-tasting than the ones we get in New York. We walked to the Palazzo dei Normanni, seeing a lot of orange trees and decaying buildings along the way. The Palatine Chapel was very impressive, with a muqarnas ceiling and opus sectile floor. 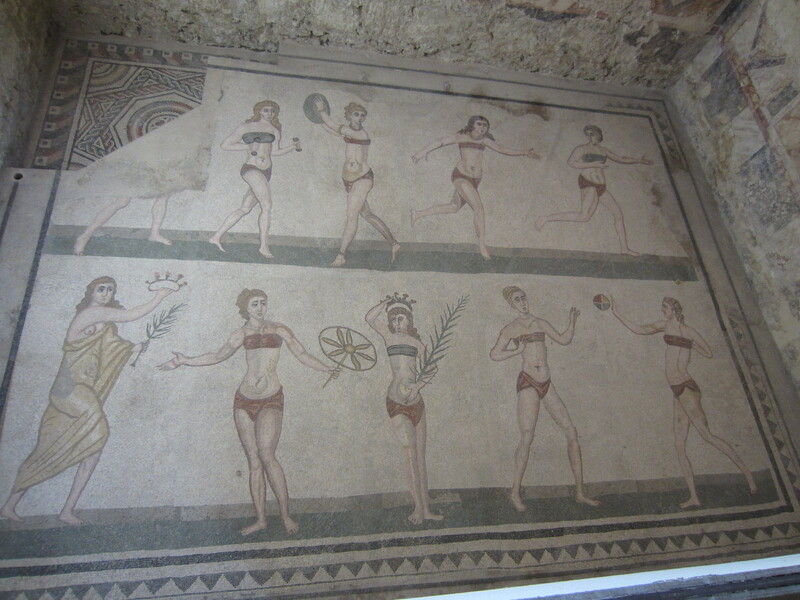 The rest of the palace was rather plain, except for the Roger II room, which was covered in mosaics like the chapel. We saw where the parliament meets, and we went down to the basement where they have the remains of a Punic fortification. After this we walked to the Ballaro market, which was really lively and gritty. R. got a spleen sandwich (one of their specialties) and a delicious lemon soda drink from a stand with a huge crowd of guys gathered around it. They also had a lot of produce, meats and cheeses. Saw tons of oranges and tomatoes. We got some excellent pecorino cheese, and I saw a man carrying a live chicken in a plastic bag. The market was my favorite part of Palermo. We wanted to go into La Martorana church but they were having a service there, so we went into the adjacent San Cataldo church, which has three peculiar red domes in the Arabo-Norman style. Next we went to Palazzo Abatellis, home of the Galleria Regionale della Sicilia, and saw The Triumph of Death. By this time most things were closing early because it was Sunday. I would have liked to have seen the archaeological museum, where they have the metopes from Selinunte. We tried to go to the Inquisition Museum but the person in the ticket booth said we had to wait for someone to come back, so we went to the Teatro Massimo instead, where some scenes from Godfather III (which I hadn’t seen yet) were filmed. We were the only ones on a pretty interesting guided tour. It’s a beautiful theater, and the panels of the roof can be opened to let in the air. We saw the royal box which anyone can sit in, as long as they buy tickets for all 27 seats. 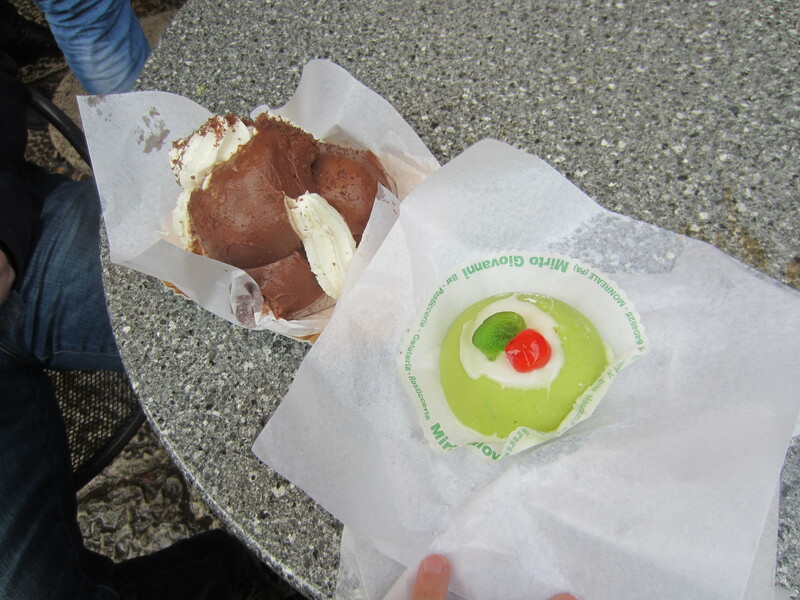 Next we went to the place where setteveli cake was invented. It tasted like regular chocolate mousse to me. In general Sicilian desserts are far too rich and sweet. The place we wanted to go to for dinner was closing when we got there (it was raining heavily), so we wound up going to a restaurant called Something da Brodo. I got pasta alla norma, I think, and R. got ravioli. It was good but pretty skimpy on the ingredients, and not cheap either. Also, why don’t they give you olive oil or butter for the bread in Sicily? We were going to try to wake up early and see the Cathedral, but we were both a little tired of Palermo’s grittiness and run-down appearance, so we just took a taxi to the Sixt car rental place. It took forever to get through the traffic, and we got stuck in traffic again when R. started driving the rental car. 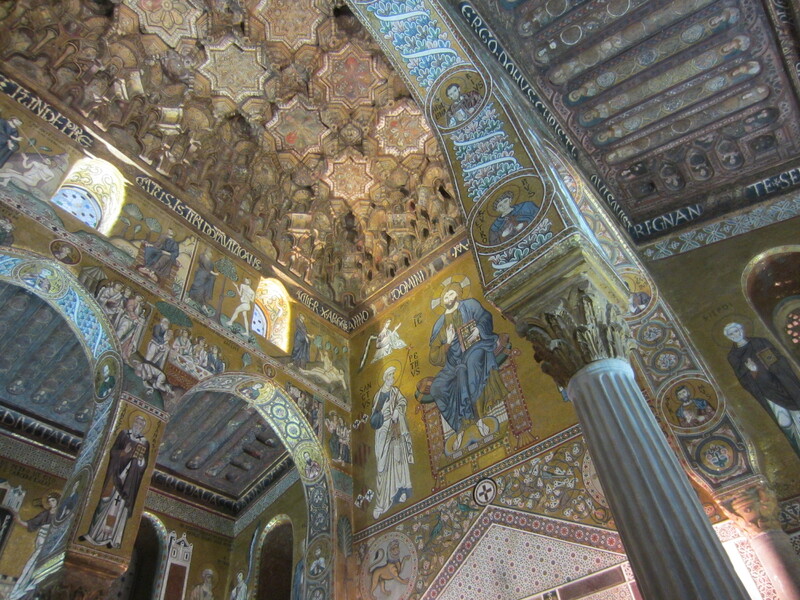 Finally we escaped Palermo and reached Monreale, where we saw the cathedral, which was a larger, grander version of the Palatine Chapel. The mosaics are very large and easy to identify. We stopped in a local place that sold pastries and alcohol together, and got a cassata and profiterole – both extremely sweet. We also got some meat and cheese from a grocery with a very friendly owner. R. and I were considering going to the anti-Mafia museum in Corleone, but I think you have to make reservations in advance for a guided tour. 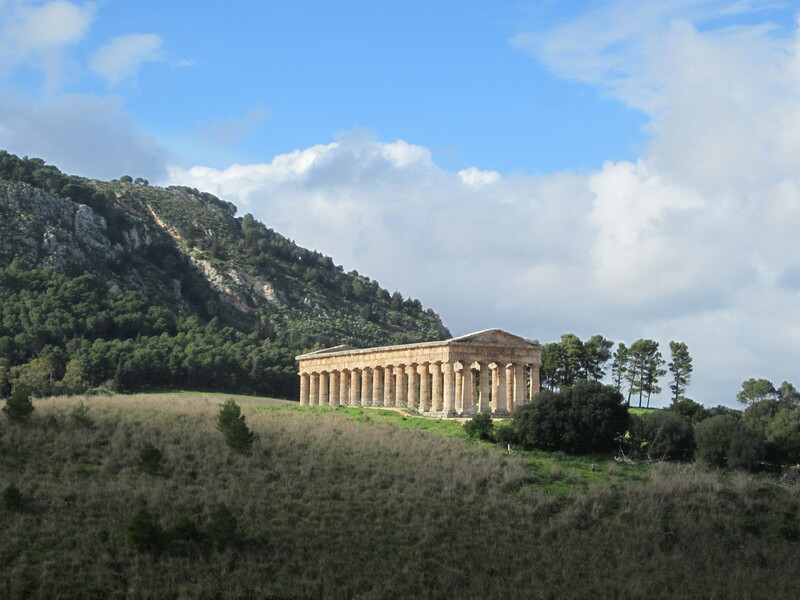 So we tried to drive straight to Selinunte, but the map and signs were so confusing that I navigated us right to Segesta instead. It’s a temple in the loveliest of settings, with a ravine and waterfall behind it. We also climbed up the mountain to see the agora and theater, which were much farther than I expected. It kept raining off and on, but we had the best views of the temple. After this we drove to Selinunte, which is an impressively large site. I got to climb on the ruins of the temples. There are two parts to the site, and you have to drive between them. The second section had an agora and an extensive fortification system, and overlooked the sea. We saw and heard flocks of sheep nearby. In this and most of the sites we visited, there were barely any other tourists. It was nice having the place all to ourselves. Next we drove to Agrigento and had a terrible time finding our hotel, which was next to the cathedral at the top of the medieval hill-town. The streets are so narrow and winding, many are one way, and the signs are terrible. We had to ask some people for directions, and one man very kindly led us up the hill on his motorcycle. We never would have found it otherwise. When we got to the B&B Liola, we found the owner, Alfonso, waiting for us. He was very nice and chatty, and spoke to us in a mix of Italian, French, and English. He and his wife lived in a nearby house. We filled out a breakfast menu for the next morning, when his wife would come to cook for us. We walked down a steep set of stairs to reach a restaurant Alfonso recommended, but we didn’t like it too much. I got some artichoke dish and R. got pasta with tuna. The medieval part of Agrigento is very picturesque, but it’s not meant for cars. Our breakfast in the morning was very good, although it was a real carb fest. 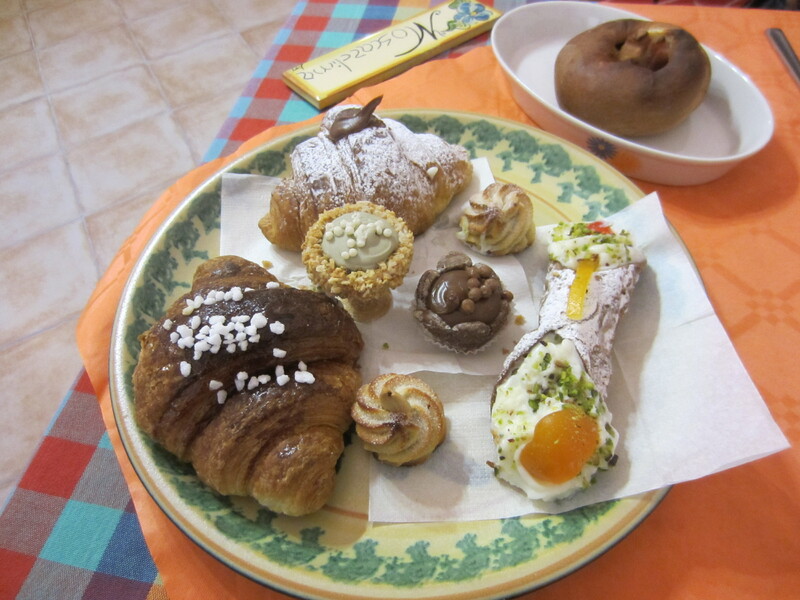 We got a cannolo, croissants filled with jam and chocolate, a pastry filled with ham and olives (a specialty of Agrigento), and other extremely sweet pastries. We also got fresh cheese and tomatoes, a scrambled egg, and fresh squeezed orange juice. I was too stuffed to touch the other things – yogurt, fruit, toast, etc. Alfonso’s wife was very nice and spoke to us in Italian. We tried to go into the cathedral but it was closed. I think they were doing work on it. So we drove to the archaeological park (Akragas), where we saw lots of temples and ruins set among yellow flowers (broom plants?) and blossoming almond trees. It was a pretty incredible sight. The Temple of Concordia is remarkably intact. Also saw some hawks and lizards. Then we went to the Agrigento archaeological museum, where they have a collection of artifacts uncovered at the site. There were a lot of vases, votive offerings, interesting molds, grave goods, a few statues, and the original telamon from the temple of Olympian Zeus. The museum itself is in the middle of ancient and medieval ruins. I wanted to go to the Scala dei Turchi, but instead we went to the Vulcanelli di Macalube, a strange site where thermal gas creates weird mud formations. 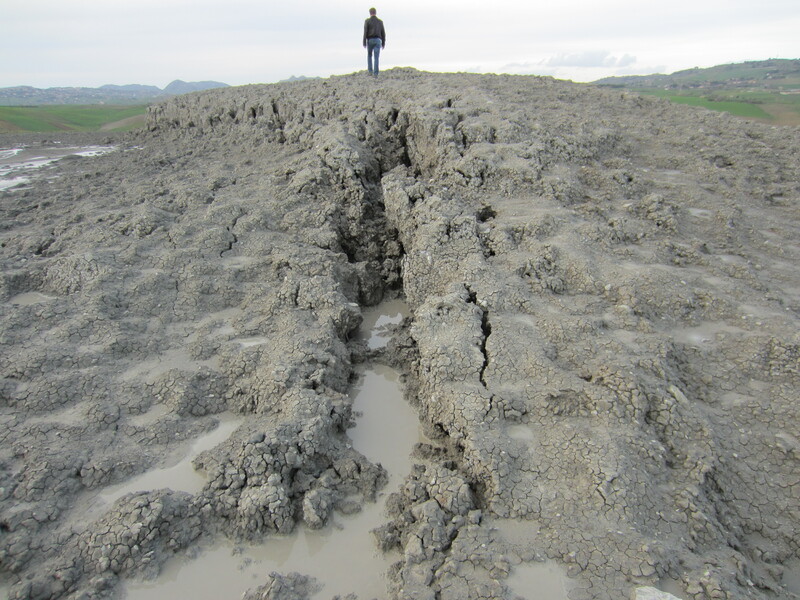 There were a few mini “volcanoes” that were oozing mud with a blurping sound. It was in the middle of the countryside and we were the only ones there, until a German couple showed up. When we drove back through the town we were stopped by a flock of sheep and goats. We kept driving to see what else we could find, and we came upon a rock formation with caves like we saw in Cappadocia. This was near the town of Grotte. I think we went to one more town after this, which was cute but not used to tourists. People kept looking at us kind of funny. We spent a long time in the car trying to find the section of Agrigento that had the best restaurants, but it was worth it. That night we had the best dinner of the trip, at a place called La Posata di Federico II. R. got an amazing pesce spada dish. I got pasta alla norma again, and the spaghetti came inside half an eggplant. R. also got an excellent veal dish. The portion size here was the best we had, and the prices were reasonable. We got very lost again on the way back to the hotel. At one point we went down a street so narrow we had to put our windows in. We didn’t know if we would make it through! The next day for breakfast we ordered less carbs and more protein. The meat and cheese were delicious. Then we drove towards the hill-top town of Enna and saw some really beautiful countryside. Enna’s a cute medieval town – very hard to drive in, of course – and we saw Il Castello di Lombardia, which is a Norman castle built over a Saracen castle built over Greek and Roman ruins. A very interesting and curious place. The cathedral and most of the other churches were closed. Next we drove to Villa Romana del Casale, which is one of the best Roman ruins I’ve been to. The mosaics just go on and on, and they’re incredibly detailed. Most interesting was the Great Hunt, showing exotic animals being transported to fight in colosseums, and the “bikini girls.” I thought it was strange how many of them had blond hair. They were doing work on the “apse” of the basilica. It was really nice how we could walk on the raised walkways and see everything perfectly. Towards the end it got really cold, and we got back in the car and drove to Syracuse. This drive took us forever, and we got lost several times because of the horrible signs. You would see one for Syracuse, and then you would just be left hanging. We stopped in a town and got directions from some guy who gave us oranges, who told us to head towards Lentini and then turn down the coast. We did that, and after a long, exhausting drive got to our hotel in Ortygia, the Domus Mariae Benessarae, which is run – or at least owned – by Ursuline nuns. The hotel was really nice and spacious. R. and I were so exhausted from the drive that we fell asleep as soon as we got in. We had a very nice buffet breakfast in the hotel (lots of fresh cheese, jam, cake, etc.). We went into the Baroque chapel next to the dining room that’s open only to hotel guests. Our hotel was right on the water, which is crystal clear. Ortygia was by far the most relaxing, laid back place we visited in Sicily. The car traffic and congestion were light compared to the other places. It has a very Mediterranean feel to it. First we went to a hotel where they discovered a Jewish mikveh in their basement that had been filled in and forgotten about for centuries, after the expulsion of the Jews. There are three baths in the central chamber (which is Byzantine style), and two private baths on the sides. The guide said they don’t know where the water comes in from, and they don’t know where it goes; but so much water comes in that they have to pump it out. We walked all around the island and saw the ruins of the Temple of Apollo and the cathedral, which was formerly the Temple of Athena. The cathedral is fascinating because you can still see the columns from the Greek temple inside and outside the current structure. It’s amazing how many layers of history Sicily has. We spent a while here, then went to the nearby Church of St. Lucy, where they have a Caravaggio painting of her burial. Next we walked into the mainland part of Syracuse to the archaeological park of Neapolis, where we saw the Roman theater, the altar where they could slaughter hundreds of cattle at one time, the beautiful Greek theater with what I believe was a limestone quarry behind it, and the Ear of Dionysus. The echoes in the ear were amazing, and you could hear the pigeons cooing and their wings fluttering as though they were giants. We had a hard time finding the archaeological museum, and when we got there they were closing. So we went to the catacombs of San Giovanni, a church that used to be the cathedral but which now is an empty shell. One thing I found interesting was that the church changed orientation (direction) after it was destroyed in an earthquake. Our tour guide was a woman who didn’t speak English very well, but what we saw was fascinating. We went into the crypt with the remains of medieval and Renaissance frescoes. The church was built on the site where St. Marcian was martyred and where St. Paul preached, I think. The catacombs were built out of a Greek underground aqueduct, and the cisterns were used as chapels. It was also used as a bomb shelter during WWII. There were rock-cut tombs everywhere, but all the ones we saw were empty. There was one that still had the cover on it, with three holes where they would pour milk, wine, and honey. I think they only found one finely carved sarcophagus. She showed us one tomb that still had Christian symbols painted on it. 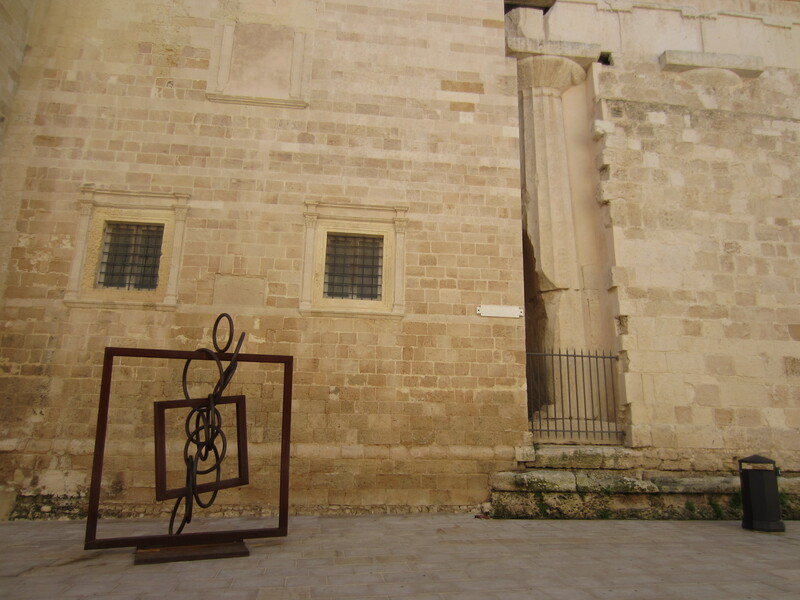 We walked back to Ortygia and had a meal that was good but forgettable, in a very homey and lively trattoria. I got ravioli in a pork sauce and R. got spaghetti with clams. After another great breakfast, we got back in the car and drove to Catania, which was a straightforward drive for once, and returned the car at the rental car place by the airport (which was not easy to find). There was no place to store our luggage, so we had to take it with us on the bus to the center of the city, since we had a few hours to kill. We could see Mount Etna as we were driving to the airport. It was white with snow and dominated the landscape, and there was some kind of mist coming off of it. Catania is a very gritty and run-down city, kind of like Palermo. We went through the extremely lively fish market, which was hard with our suitcases, and into the piazza in front of the cathedral, where they have an elephant statue carved out of volcanic rock. The cathedral has a lot of volcanic rock in it too, and stands on the place where St. Agatha was martyred. I think her festival had just ended, and they had lots of palanquins (?) in the aisles with statues showing her breasts being cut off. I also saw Bellini’s tomb. We walked down the Via Etna, where you can see part of Mount Etna in the distance, but our luggage was too heavy for us to walk far. I got a sesame candy from a stand. After this we took the bus back to the airport and got on our EasyJet flight to Paris. For some reason they let me check my suitcase for free, which was nice. I hadn’t been in Paris in over 10 years. From the airport, we took the train to Gare du Nord, and our hotel (Hotel Gare du Nord) was right there. Our hotel was nice enough, but I really don’t like that neighborhood. There were lots of drunk people, homeless people, etc. We walked around Paris a tiny bit, just enough to see Sacre Coeur from a distance. We also got a croissant and a pain au chocolat, both of which were delicious. R. got some cheese from an amazing supermarket. 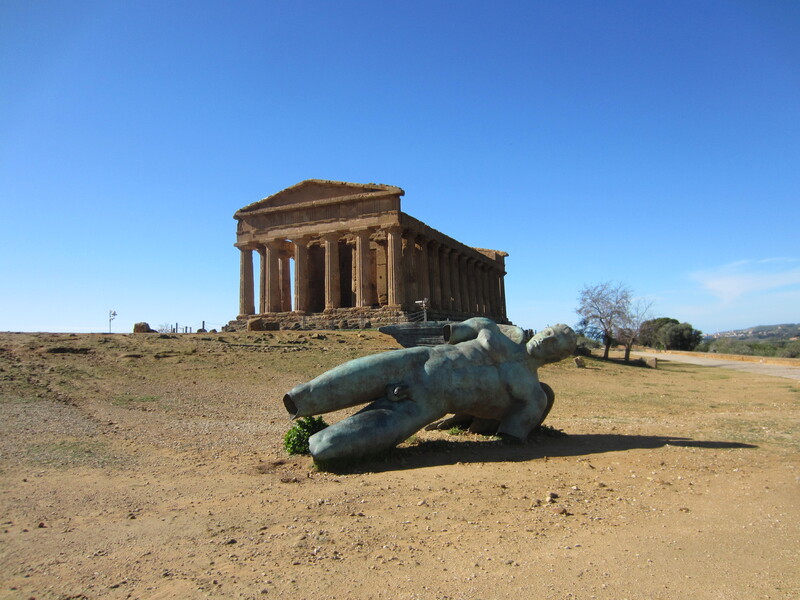 My overall impression: Sicily is a fascinating place, with the best Greek temples outside of Greece, but it’s much grittier than northern Italy, and it’s not an easy place to get around by yourself! Prepare to drive a stick and deal with lots of tailgating drivers and a serious lack of signage.